In The news: Union government has proposed to double the expenditure on the Digital India programme. 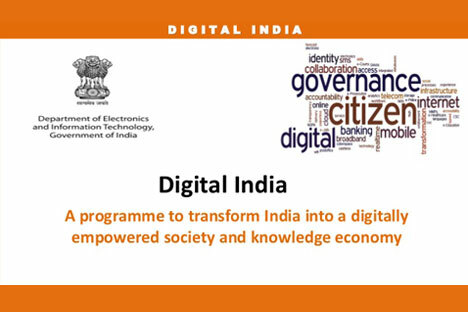 The Digital India programme is a flagship programme under Ministry of Electronics and Information Technology. The vision of this program is to transform India into a digitally empowered society and knowledge economy. Digi Locker – The service was launched to store crucial documents like Voter ID Card, Pan Card, BPL Card, Driving License, education certificates, etc. in the cloud. MyGov.in – The portal works as an online platform to engage citizens in governance through a “Discuss”, “Do” and “Disseminate” approach. E-Sign Framework – This initiative would enable users to digitally sign a document online using Aadhaar authentication. Swach Bharat Mission mobile app – The app will enable organizations and citizens to access information regarding the cleanliness drive and achieve the goals of the mission. National Scholarship Portal –From submitting the application, verification, sanction and disbursal to end beneficiary, everything related to government scholarships can be done on this single portal online. E-Hospital –Online Registration System under this initiative enables people to avail services like online registration, payment of fees and appointment, online diagnostic reports, checking on the availability of blood online, etc. Digitize India Platform –This initiative will involve digitization of data and records on a large scale in the country to make easy and quick access to them possible. Bharat Net –Under this initiative, a high-speed digital highway will connect 2, 50,000 gram panchayats of the country. This is the world’s largest rural broadband project using optical fibre. Wi-Fi Hotspots –Development of high speed BSNL Wi-Fihotspots throughout the country is yet another initiative to improve digital connectivity in the country. Next Generation Network –Launched by BSNL, this service will replace 30-year old telephone exchanges to manage all types of services like voice, data, multimedia and other types of communication services. Electronics Development Fund –The fund will be set up to support the manufacturing of electronics products that would help create new jobs and reduce import. Centre of Excellence on Internet of Things (IoT) –In partnership with NASSCOM, Centre of Excellence will be established for rapid adoption of IoT technology and encourage a new growth strategy. Expenditure on programme doubled to Rs. 3,073 crore for the next financial year from Rs. 1,425.63 crore in 2017-18. The Government also proposed to set up 5 lakh Wi-Fi hotspots which will provide broadband access to 5 crore rural citizens. The Budget proposed an allocation of around Rs. 14,500 crore to strengthen telecom infrastructure projects, including BharatNet, during the upcoming fiscal. Of this, Rs. 4,500 has been allocated for building a dedicated optical fibre-based communications network for defence forces in lieu of airwaves vacated for civilian use. NITI Aayog would initiate a national programme to direct efforts in the area of artificial intelligence, including research and development of its applications. The Classic IAS Academy is regarded as the Best IAS Coaching in Delhi. The Academy steadily works towards realizing the dreams of both the Hindi and English students to participate in the civil service examination. The Academy also conducts seminars and workshops with the help of experts in order to train the student to think, feel and express like civil servants.